A Formotion clock has resided on my ZR-7S for at least 30,000 miles so far, stuck to a homemade aluminum bracket on my instrument cluster using 3M Dual-Loc. Even though it sits in the sun all day in my office's parking lot, the beautifully machined 1.5" dia. black alloy case looks nearly new and the numbers on the white face show no fading. Formotion says its waterproof; not a drop has penetrated mine and it has seen a fair bit of rain. It keeps time extremely well, the battery lasts a few years, and it seems tough as nails. Not cheap at about $38 US, but worth it. I can't find anything negative to say about it. Formotion makes the same basic clock in stick-on and bolt-on varieties and in several combinations of case and face colors, including a glow-in-the-dark face option. 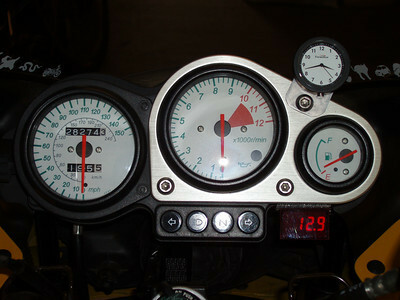 If your motorcycle doesn't have a built-in clock, you can't go wrong with a Formotion.